Balloon Typhoon - Includes 100 unfilled 5inch balloons. 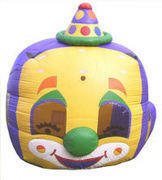 Balloon float around on the inside while toddlers jump. This is designed for the 1-7 year old age range. This unit requires 15ft x 15ft x 13ft in actual space, power within 50ft of a dedicated electrical outlet free of glass, rocks, sharp objects, dog bombs, tree limbs/branches, gutters, etc.